​Documents - whether physical or digital - are essential for maintaining high quality communication with customers. The section "Solutions for Successful Customer Communication" provides a glimpse of what efficient, longstanding communication solutions look like in today's business environment. Here we would like to focus on what to expect when using modern document creation techniques... and how M/TEXT aids and assists with a variety of tasks. Create a positive impression, ensure relevance, and reduce rates of return. ​Worthwhile content is created using quality data. M/TEXT's extensive interface strategy makes use of all available data sources to create optimally individualized communication. M/TEXT is your source for all company documents. It creates universal basic documents which can then be used to generate any and all required formats, physical or digital, such as letters, e-mails, SMS, barrier free PDFs and more. ​Document processes that are, as much as possible, triggered by events and run by the system with minimal human interaction are simply unbeatable in terms of efficiency, cost, and security. Our goal: industrialization of the value-added chain. 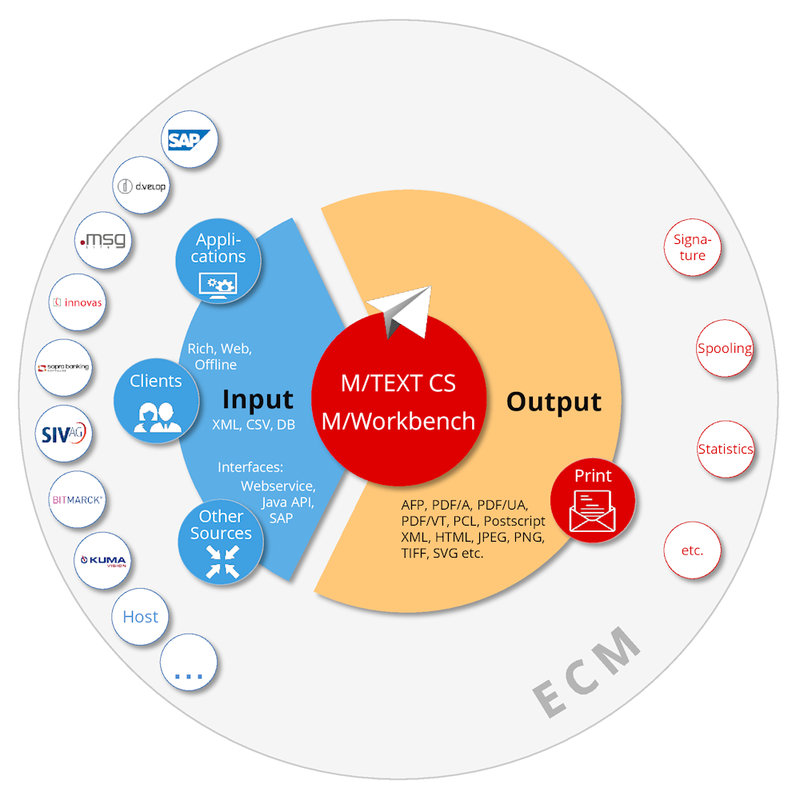 M/TEXT is designed to carry out automated processes, either fully automated or batch processing tasks. It is capable of managing tasks with print runs in the millions, all within the assigned time. Even without full automation, your interactive online document creation can be prepared largely automatically. Users profit from our 'intelligent' Editor, which, once set up, can be used to efficiently complete the documents. The central development goal of our entire M/ Product Series is to automate document processes as much as possible. More flexibility when developing new services and documents, in terms of application scalability, integration in environmental processes and systems, and much more. The M/TEXT system composes documents individually down to the smallest unit, including text variations or graphic elements such as charts or images. Our M/Workbench development tool gives Advisors and administrators wings. M/TEXT applications are based on modern Java EE technology, which means it is scalable, runs 24 hour operations, and has very high system stability. M/TEXT is perfect for any user, as the Client is available at any work station - on the web, at your desktop, or online. Online creation makes M/TEXT particularly popular with employees; our Editor employs modern conventions common to other word processing programs, such as Word or LibreOffice. Not only that, our 'intelligent' Editor adapts for each unique work situation, offering only those functions required by the user - no more, no less.